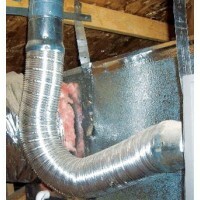 Flexible duct is manufactured by laminating Aluminium foil, two ply of polyester film over a spring steel wire helix to give excellent strength and flexibility. 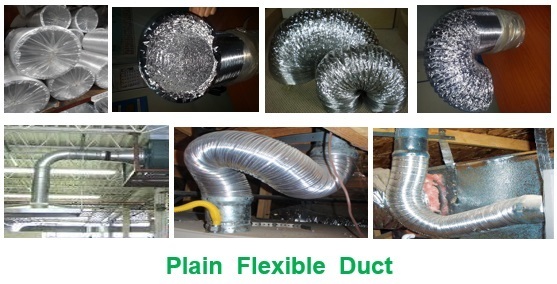 Flexible Duct is extremely versatile and flexible, suitable for all high and low velocity air conditioning and ventilation systems. It is specially designed and used in air-conditioning and ventilation systems for commercial, industrial and residential applications. Diameter available from 3" ~ 48" (076mm ~ 1200mm). Plain Aluminium Flexible Duct is extremely versatile and flexible, suitable for all high and..
Pre-Insulated Aluminium Flexible Duct comprises two concentric Helical Ducts that house the fiber..
Semi-Rigid Aluminum Duct is flexible for easy installation in limited space yet retains its shape..